In the past, cancer was a biologic mystery, with combinations of toxic chemotherapies seemingly the only path to a cure.1 Over the past decade, advances in precision medicine in oncology have enabled the use of molecular information, specifically gene expression data, to predict how patients will respond to various drugs.2 The personalized treatment of cancer that is guided by molecular biomarker assessment requires a team approach—a collaborative effort between the pathologist and the treating oncologist—to achieve informed and effective individualized therapy. However, it has been proposed that “a failure to properly understand molecular biomarkers has prevented their widespread adoption in treatment, comparative benefit analyses, and their integration into individualized patient outcome predictions for clinical decision-making.”3 In this regard, experts in the fields of medical oncology and molecular pathology may provide guidance in understanding how to best utilize molecular biomarkers in developing individualized therapy for patients with lung cancer. An example of best practices in incorporating molecular biomarker testing in delivering precision therapy in lung cancer was provided in a conversation between Geoff Oxnard, MD, a thoracic oncologist at Dana-Farber Cancer Institute and Associate Professor of Medicine at Harvard Medical School, Boston, MA, and Lauren Ritterhouse, MD, PhD, a molecular pathologist and Co-Director of the Molecular Diagnostics and Clinical Genomics Laboratories, University of Chicago, IL. These 2 experts shared their perspectives on how oncologists and pathologists can work together as part of the cancer care team to deliver optimal personalized care for their patients. Many of their insights can be applied broadly to both academic- and community-based practices striving to meet the challenge of effectively incorporating biomarker testing into their treatment of patients with lung cancer. This exchange between the medical oncologist and molecular pathologist set the stage for a discussion regarding the impact that molecular biomarkers have had on their clinical practices. One of the greatest challenges in incorporating molecular biomarkers into patient care is that reports on new biomarkers or new applications of existing biomarkers are occurring at a dizzying pace, making it difficult for medical oncologists to utilize the most current information in making treatment decisions for their patients. 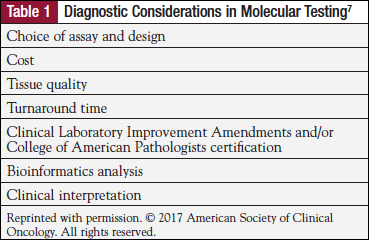 Similarly, molecular pathologists have the complex task of prioritizing which biomarkers to include in the test panel to be able to answer the treating physicians’ most important questions regarding turnaround time, efficiency, and getting the answers they need to make informed treatment decisions quickly for their patients. Individual prognostic biomarkers or combinations of prognostic biomarkers predict the likelihood of a disease-­related outcome during a specific time period. Although prognostic biomarkers are typically better predictors than risk biomarkers, cancer is a complex disease process, and therefore rarely can a lone biomarker accurately predict a disease outcome.3 Thus, the oncology treatment team often asks the pathologist to offer a broad spectrum of molecular biomarkers in the test panel to make the treatment decision as informed as possible. For example, many targetable activating mutations have been found in non–small-cell lung cancer (NSCLC), including mutations in ALK, EGFR, FGFR, HER2, KRAS, MET, RET, and ROS1, that will inform targeted therapies,1,4 as well as PD-1/PD-L1 that will prompt the use of immunotherapy with immune checkpoint inhibitors.5 However, it is critical to prioritize the number of biomarkers requested by the oncologist. To minimize the aforementioned issues, it is critical for the oncology treatment team to engage in active communication with the pathologist. Dr Oxnard and Dr Ritterhouse agreed that clear and frequent communication between surgical and medical oncologists and pathologists is crucial for optimal molecular biomarker testing in patients with lung cancer. In the large academic centers where they work, the surgical or medical oncologist places the order for molecular biomarker testing, and, in some cases, the process of immunohistochemistry (IHC) and molecular analysis is initiated as soon as a pathologic diagnosis of NSCLC is made, sometimes even before the medical oncologist has seen the patient. Most pathology laboratories have standard IHC and molecular tests they include in their panels. However, communication between the treating physician and the pathologist is most important in cases where the oncologist wants information on molecular biomarkers not routinely included in the panel. This communication occurs either at a tumor board meeting or through personal conversation or e-mail. In some cancer centers, a special weekly biomarker meeting is convened; this meeting includes surgical, medical, and radiation oncologists and pathologists. These professionals do not meet to discuss individual patients, but to evaluate the menu of biomarkers that need to be included in the pathology laboratory’s armamentarium as a result of the latest clinical data presented at cancer meetings or published in seminal journals, as well as to evaluate resource allocation for the pathology department. 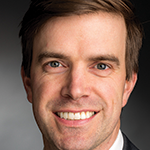 For example, a number of presentations at the 2018 annual meeting of the American Society of Clinical Oncology addressed the efficacy and safety of RET inhibitors for NSCLC, and strategies for RET-directed targeted therapy are now being considered before single-agent immunotherapy.6 Will this trigger oncologists to request that this biomarker be included in every testing panel for patients with NSCLC? How will this affect the workflow of the pathology laboratory? The electronic medical record (EMR) can also be used to communicate among the cancer care team and the pathology laboratory, and to increasingly structure the oncologist’s communications with interventional radiology and pathology. For example, the oncologist can specify in the EMR that multiple cores are needed for genomics, that a fine needle aspiration biopsy is needed, etc. Formalized requests through EMRs are yet another way for treating physicians, surgeons, interventional radiologists, and pathologists to communicate so that suitable samples are collected and the appropriate tests are ordered. PD-1/PD-L1 testing is a good case in point. Quantifying PD-L1 provides the oncologist with valuable information, since the higher the PD-L1 staining percentage, the more likely the chance of benefit from single-agent immunotherapy. In the patient who presents with newly diagnosed advanced NSCLC, whether squamous cell or nonsquamous cell, if the PD-L1 staining percentage is greater than 50%, single-agent immunotherapy is appropriate and there is a better chance of response with less toxicity.5 If the PD-L1 staining percentage is less than 50%, chemotherapy or chemotherapy plus immunotherapy is the choice, but with the potential for greater toxicity.5 In the recurrent disease setting or as second-line therapy, if the patient is anti–PD-1 naive, immunotherapy can be used. This requires close communication between the oncologist and the pathologist on how to report PD-L1 staining, particularly the PD-L1 staining percentage increments being reported. Another way to streamline the biomarker testing process and reduce turnaround time is for the clinician placing the order for testing to communicate clearly to the pathologist what he or she is looking for (ie, details about the patient and the specific molecular targets of interest). 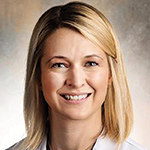 Again, communication is key—the medical oncologist may order the biopsy and include a wealth of information in the order, but the surgical oncologist or interventional radiologist may actually write the pathology requisition. Thus, care must be taken to transmit all the information from the entire cancer care team to the pathologist to ensure that the correct testing is carried out. Before 2018, the Centers for Medicare & Medicaid Services (CMS) “14-day rule” did not allow reference and independent laboratories to bill Medicare directly for molecular pathology tests if they were ordered less than 14 days from an outpatient’s hospital discharge date.16,17 Rather, the laboratory would be reimbursed by the hospital, which would bill Medicare. If molecular tests were ordered within 14 days of a patient’s discharge, CMS treated them as if they were bundled into hospital payment packages by the Hospital Outpatient Prospective Payment System (OPPS) fee schedule, which they were not. The problematic issue here is the CMS date of service (DOS) policy, which specifies that the DOS for clinical diagnostic laboratory services be the date the specimen is collected, not the date the test is done. Per Medicare, this may affect payment for a test, particularly if specimen collection occurs during the patient’s hospital stay but testing is done after the patient is discharged. Not only does this represent an administrative challenge for the laboratory and the hospital, but it also may result in delays in patient testing, access to test results, and decisions regarding treatment plans. Gene sequencing procedures, proprietary laboratory analysis tests, and protein-based molecular multianalyte assays with algorithmic analyses are not included in the CMS 2018 exception; therefore, hospitals must continue to bill Medicare if these tests are ordered within 14 days of an outpatient’s discharge date. The experts were also asked to share best practices and key success factors in their institutions that other cancer centers or private practices may adopt to optimize molecular biomarker testing. Mamdani H, Ahmed S, Armstrong S, et al. Blood-based tumor biomarkers in lung cancer for detection and treatment. Transl Lung Cancer Res. 2017;6:648-660. Suphavilai C, Bertrand D, Nagarajan N. Predicting cancer drug response using a recommender system. Bioinformatics. 2018 June. doi:10.1093/bioinformatics/bty452. Epub ahead of print. Burke HB. Predicting clinical outcomes using molecular biomarkers. Biomark Cancer. 2016;8:89-99. Cheng L, Alexander RE, MacLennan GT, et al. Molecular pathology of lung cancer: key to personalized medicine. Mod Pathol. 2012;25:347-369. Tsiara A, Liontos M, Kaparelou M, et al. Implementation of immunotherapy in the treatment of advanced non-small cell lung cancer (NSCLC). Ann Transl Med. 2018;6:144. Sabari JK, Offin MD, Wu SL, et al. RET-rearranged lung cancers: immunophenotype and response to immunotherapy. Presented at: 2018 Annual Meeting of the American Society of Clinical Oncology; June 1-5, 2018; Chicago, IL. Abstract 9034. Schwartzberg L, Kim ES, Liu D, et al. Precision oncology: who, what, when, and when not? Am Soc Clin Oncol Educ Book. 2017;37:160-169. https://meetinglibrary.asco.org/record/137923/edbook#fulltext. Accessed June 14, 2018. Lim C, Tsao MS, Le LW, et al. Biomarker testing and time to treatment decision in patients with advanced nonsmall-cell lung cancer. Ann Oncol. 2015;26:1415-1421. Nagrath S, Sequist LV, Maheswaran S, et al. Isolation of rare circulating tumour cells in cancer patients by microchip technology. Nature. 2007;450:1235-1239. Mocellin S, Hoon D, Ambrosi A, et al. The prognostic value of circulating tumor cells in patients with melanoma: a systematic review and meta-analysis. Clin Cancer Res. 2006;12:4605-4613. Pantel K, Alix-Panabières C. Circulating tumour cells in cancer patients: challenges and perspectives. Trends Mol Med. 2010;16:398-406. Tanaka F, Yoneda K, Kondo N, et al. Circulating tumor cell as a diagnostic marker in primary lung cancer. Clin Cancer Res. 2009;15:6980-6986. Wong MP. Circulating tumor cells as lung cancer biomarkers. J Thorac Dis. 2012;4:631-634. Krebs MG, Sloane R, Priest L, et al. Evaluation and prognostic significance of circulating tumor cells in patients with non–small-cell lung cancer. J Clin Oncol. 2011;29:1556-1563. Hofman V, Ilie MI, Long E, et al. Detection of circulating tumor cells as a prognostic factor in patients undergoing radical surgery for non-small-cell lung carcinoma: comparison of the efficacy of the CellSearch Assay™ and the isolation by size of epithelial tumor cell method. Int J Cancer. 2011;129:1651-1660. The new year rings-in change to CMS’ “14-Day Rule” for its laboratory date of service policy [white paper]. www.apsmedbill.com/whitepapers/new-year-rings-change-cms%E2%80%99-%E2%80%9C14-day-rule%E2%80%9D-its-laboratory-date-service-policy. APS Medical Billing. Published January 16, 2018. Accessed June 20, 2018. Centers for Medicare & Medicaid Services. Laboratory date of service policy. CMS.gov website. www.cms.gov/Medicare/Medicare-Fee-for-Service-Payment/ClinicalLabFeeSched/Clinical-Lab-DOS-Policy.html. Updated February 27, 2018. Accessed June 14, 2018. Allen TC. Payment for cancer biomarker testing. Arch Pathol Lab Med. 2015;139:300-304. Shelley S. Biomarkers create opportunities, complicate drug dispensing. Pharm Commerce. 2012;7:21. http://pharmaceuticalcommerce.com/brand_communications?articleid=26582. Published July 16, 2012. Accessed June 14, 2018. 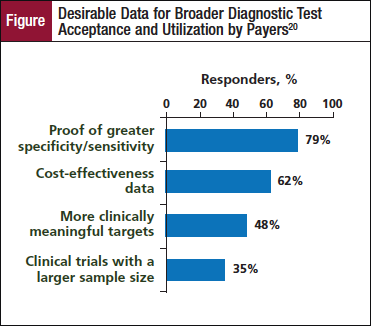 Trogan G. What do payers want in oncology diagnostics? : insights from a national survey of top commercial and Medicare health plans. Am Drug Health Benefits. August 2011;4(special issue). www.ahdbonline.com/issues/2011/august-2011-vol-4-no-4-special-issue/790-article-790. Accessed June 14, 2018. Dupere B. Companion biomarkers and cancer treatment: lessons learned for oncology new product planning. Oncol Bus Rev. September 2008:24-29. Thariani R, Veenstra DL, Carlson JJ, et al. 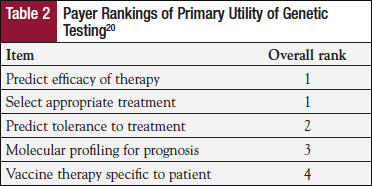 Paying for personalized care: cancer biomarkers and comparative effectiveness. Mol Oncol. 2012;6:260-266.